Did you think that life in the mountains was tranquil? I did. 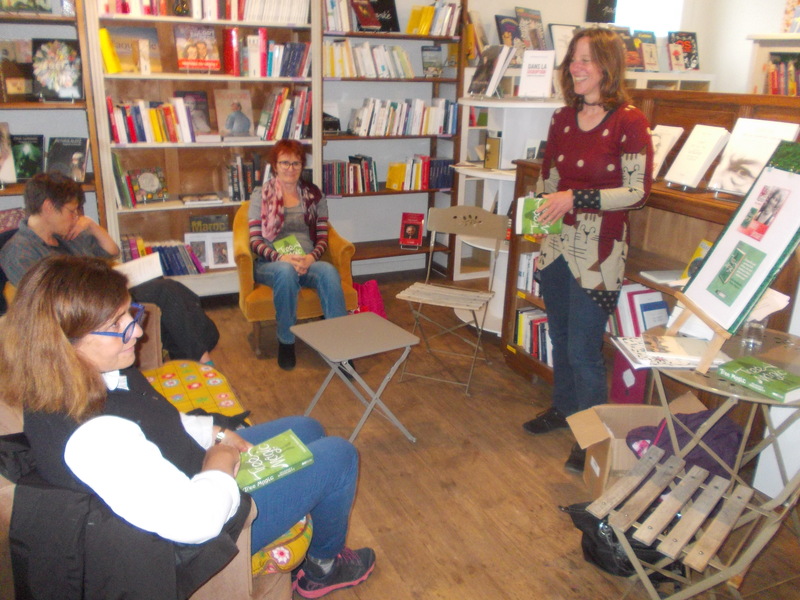 But that was before I met Françoise and Karine; before they introduced me to the friendly valley folk; before I got talking to the artists and culture-lovers who drop into Le Kairn bistro-bookshop. It’s non-stop activities and invitations here, I’m telling you. If you want to meet like-minded people, Arras-en-Lavedan is the place to be. Even some famous bloke from French television will be here on Thursday, so I hear. Anyway, after the exertion of yesterday’s transhumance, today was a little less physical but just as wet and busy. 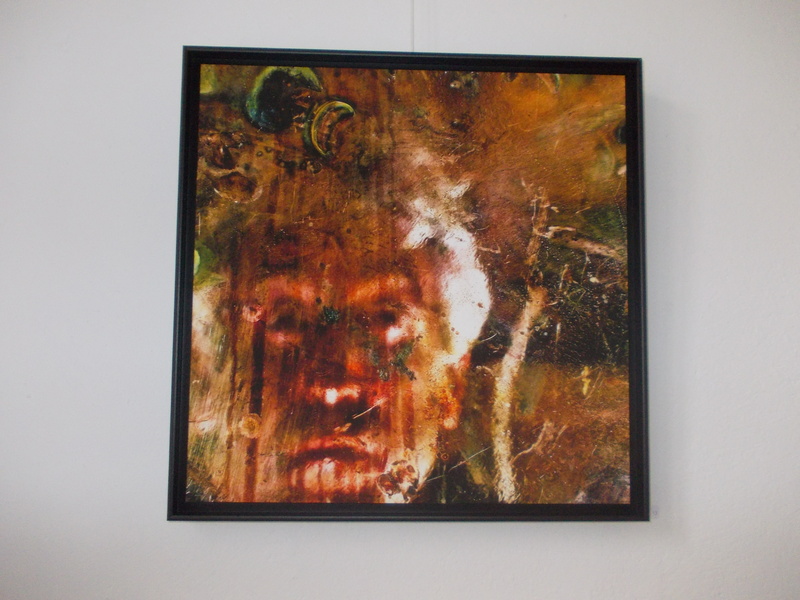 It was also far less spooky (although the exhibiting photographer here at the Maison des Arts, Raphäel Paya, did have a go at making me scream). Yes, she’s making cheese – today’s batch was Tome Des Pyrénées made from ewes’ milk. 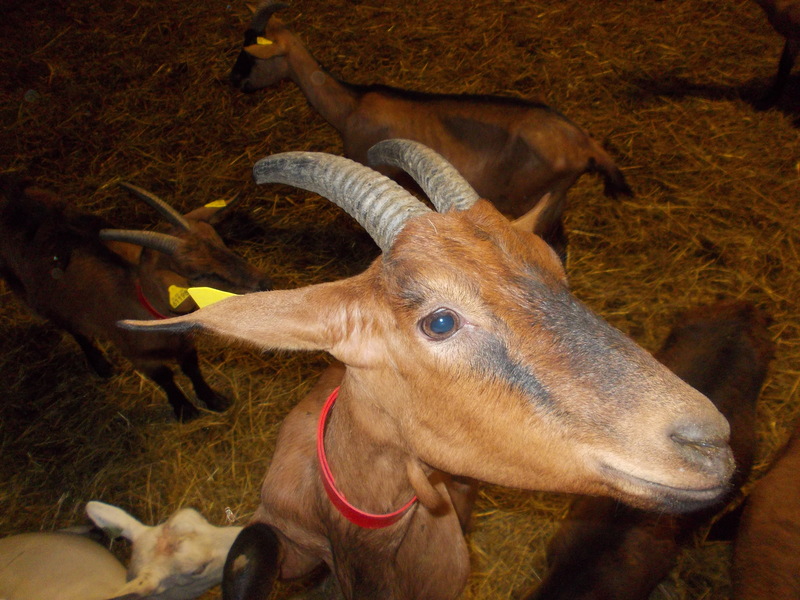 She also makes goat cheese and mixed-goat-and-ewe cheese, all of which you can taste and buy at their farm. I’m not going to try to teach you all about cheese in a 500-word blog post, but if you read the novel I’m researching (and writing in the small hours here), you’ll pick up some tips. Here’s a brief explanation to go with the photos, though, because if I keep meeting interesting people it will be ages before my notes become a story. Before we entered the room, which was lightly perfumed with ‘suckling baby’, Dominique had already begun her daily task of heating a vat of the day’s milk to 55°C. While we watched, she made the milk curdle by stirring it with that strange guitar-like instrument. Then she de-curdled it, this time stirring it with her arm for 30 minutes until the curds and whey separated. Next, she gathered the curds, threw away the whey (ooh, those words sound nice together), gathered up the curds into a doughy ball, which she cut into chunks and kneaded into the moulds. I had lots of ideas while watching and listening: muscular right arms; music and goats; listeria and salmonella… And I liked the mix of traditional and modern when Dominique stirred with her right arm and answered her mobile phone with her left. But time was pressing, and I had to go to Le Kairn to prepare my Tree Magic talk. In reality, this meant eating lunch with Karine and meeting French writer Manoell Bouillet, who had dropped by and introduced herself to Karine. Manoell writes plays and creates soundscapes, and may help Karine create a poetical circuit around the village. I told you Le Kairn was a networking hotspot. Karine went back to work behind the bar, Manoell and I had writerly discussions – and then I introduced her to Alex (who I met on Saturday, and who works on the art circuit in the village) before welcoming my first talk guest. Here’s a photo of me during the talk. There are actually at least 500 fans sitting just out of sight and lots of security guards to keep back the screaming crowds who forgot to book and couldn’t squeeze in. Seriously, it was great to meet some readers and discuss writing experiences. The lovely Scottish playwright Gloria Carreno was a real inspiration to me because she writes plays in English and French. She has produced them in Edinburgh and London – in fact one is currently under consideration with La Comédie Française – and it was fascinating to listen to her experiences of how a script becomes a play. She’s also keen to meet other playwrights – and theatres which would like to produce her work. With the day’s activities over, I was able to return to my little room, where I typed long into the night. Tomorrow is going to be a calm, writing day. 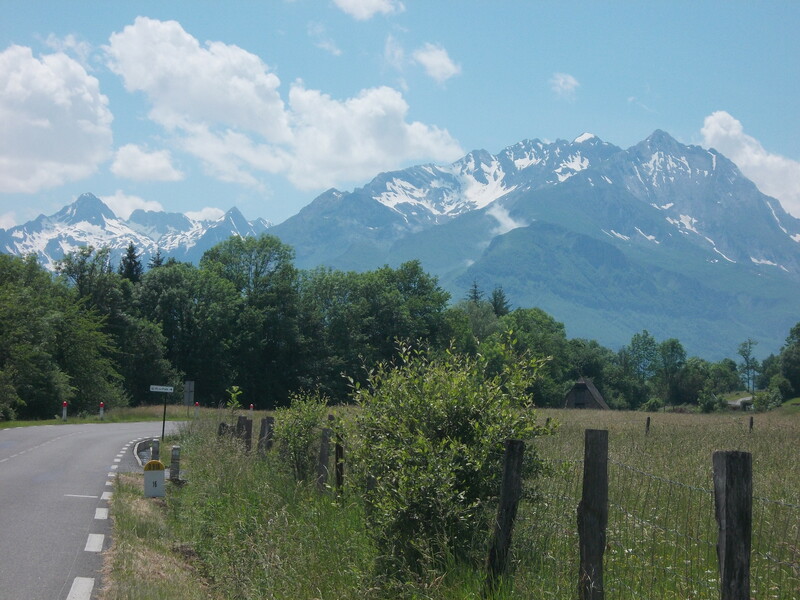 This entry was posted in Life in France, On Writing and tagged Gaec Val d'Azun, Gloria Carreno, Le Kairn, Manoell Bouillet, Tree Magic on 5 June 2017 by harrietspringbett. Wow, sounds like you are having an amazing time Harriet! Love the pictures. Glad to hear you enjoyed your author event! Glad you like the pics. They’re actually to help me remember things in the months to come. And yes, it was great to talk while surrounded by books. Of course! I bought two huge chunks to take home with me (although I admit I did nibble from them before they got to the house…). Thanks for dropping by, Rosie. I read your #AllAboutFrance driving priorities post just now, which was interesting, but I struggled to leave a comment. Thanks Annette. Struggling through a crowd of adoring fans was difficult, but luckily I had my 15 bodyguards with me. And a pair of sunglasses. So yes, I escaped intact! Sounds like a wonderful time. Congratulations on your writing success! It’s so fantastic that you were able to watch the whole cheese-making process. It makes the cheese taste even better when you see it being made! Well… as long as you don’t see anything to put you off! Ha ha. Thanks for reading and leaving a comment.